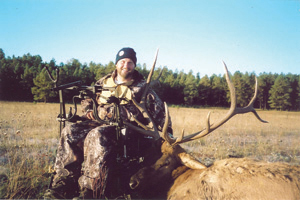 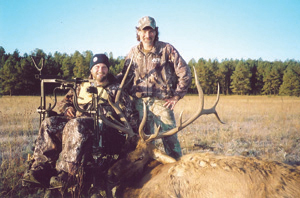 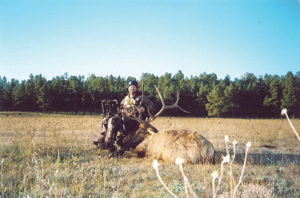 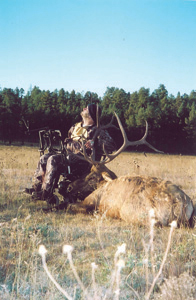 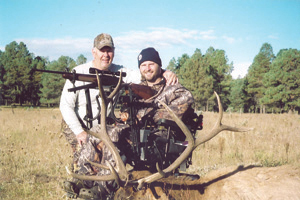 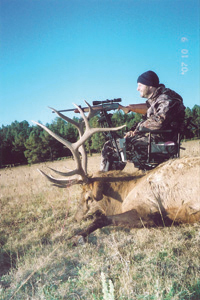 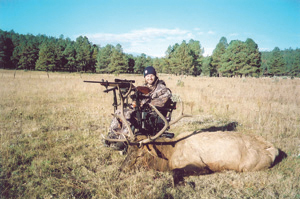 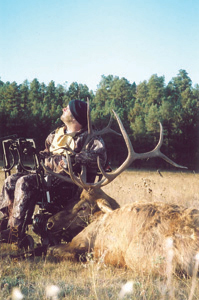 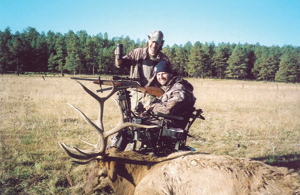 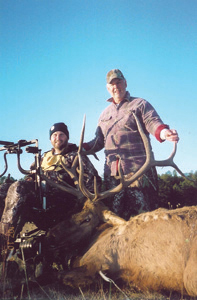 I drew a tag for a “handicapped” hunt in new Mexico for elk…the hunt was a riffle hunt early October in the middle of the rut..
Sunday (next morning) – Before dark we go back to where we had growler coming in and guess who was bugling loud…Yep Growler…So we take off down a old cat road in my chair and start calling…Here he comes and its light now…I sit there just waiting for him to step out and guess what…Someone walked in around behind us and shoots a small bull in the heard….Growler gone….Brandon was irate…I was super stoked to just be in a place where elk were bugling 60 yards away from ME again…So that evening as we are driving again we see another 5×5..I get crosshairs on him and Brandon says…”Don’t Shoot”…I look at my dad and he’s just shaking his head…I was smiling…2 great bulls and don’t shoot…. 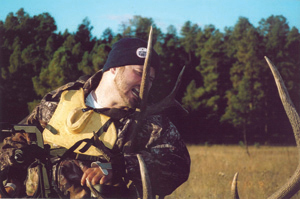 Monday – this was a non-eventful day…nothing around and real quiet… Brandon says Tuesday is our day…Hunters are gone and the elk will be back…Ok I’ll hold out for a big one Tuesday then anything Wednesday…Brandon says “ok” and I put my faith back into him..
Tuesday – Got set-up again in the dark and start driving as first light…We come around the corner and dad yells “cows”. 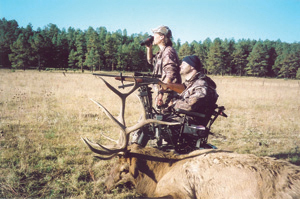 Brandon says “Where are the bulls!” and there they were 550 yards away…There was 3 of them….Brandon says “The one walking away to the right is the one you want Rich”…So I get out on the van lift and I say he’s to far for me…500 yards is out there…So Brandon says give him a sec he’s heading to the road…I am actually pretty calm as I look over and see the other two bulls are fighting….Super Kool…So we back up on the road and go down the road in reverse…This leaves the lift out on the side of the road the bull was last seen on..I back-up and see him walking out in a field…I say “Stop” and I didn’t have a clear shot…So I say ”I’m getting down on the road”…I get down on the road and we see him browsing at 330 yards…I pull up and set my crosshairs…Brandon calls to stop him… I put my crosshairs across his back and pull the trigger with my teeth…and the bull drops with a spine shot and paralyzed him…Ironic huh…So my dad runs up to a tree for a rest and he finishes him off in the neck….The look on my dads face of pure enjoyment will never be forgot…I don’t think he’s ever been more proud and we did it together…This was our first/only bull we have gotten and it’s a great starter bull….As we relaxed before going out to him…Guess who called one more time to say “Thanks for getting rid of his competition”…yep GROWLER….I’ll be back for him…My bull was a 6×6 scored out at 300…and yes the whole hunt was caught on tape…Life-time memory.